Sophomore point guard Katie Benzan, a first-team All-Ivy selection, leads a strong returning nucleus for a Crimson squad that fell to Penn 57-52 in the Ivy tournament semifinals. They each had their shot. After a season that yielded some strong wins but also unfortunate losses for the men’s and women’s basketball teams, both came up just short of reaching the NCAA tournament. For the men, the shot at the NCAAs was literal: with five seconds left in the Ivy League tournament championship game and his team trailing Penn 68-65, Justin Bassey ’20 hoisted a three-point shot that would have tied the score. It caromed off the backboard, but the Crimson grabbed the rebound, leading to a corner three-point attempt from Christian Juzang ’20. That missed as well, and Harvard watched as the Quakers celebrated the tournament crown and the accompanying automatic NCAA bid. It was a sequence that embodied the season. It was remarkable that the Crimson reached that game and had a chance to tie the score. During the year, the team had lost key players to illness and injuries—most notably point guard Bryce Aiken ’20, the 2017 Ivy League Rookie of the Year—but still managed to finish with a 18-14 record overall and 12-2 in the league to earn a share of the regular-season Ivy title. The team then throttled Cornell 74-55 in the tournament semifinals to reach the championship, where, despite losing Ivy League Player of the Year Seth Towns ’20 to a knee injury late in the second half, Harvard rallied from 10 points down to take the lead briefly and set the stage for those dramatic last-second shots. But the execution on that possession showed the Crimson’s youth and inexperience. After the game, Stemberg coach Tommy Amaker noted that Bassey showed impressive confidence and aggressiveness in attempting the shot—but he might also have rushed it slightly. 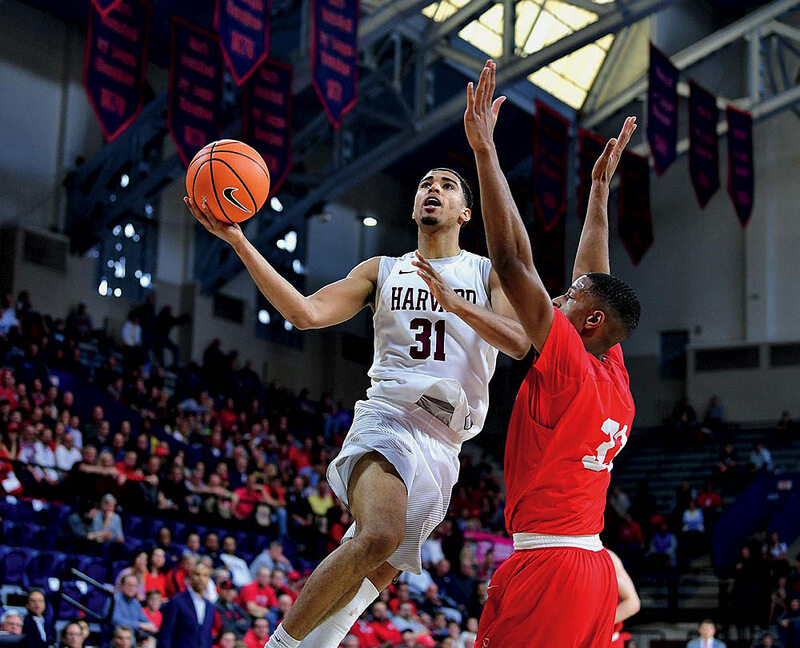 Unlike Penn, which got 19 first-half points from senior Darnell Foreman, Harvard’s lineup that afternoon—and throughout the season—consisted almost exclusively of freshmen and sophomores. The Crimson lacked the poise and maturity to play well throughout complete games and steady themselves in the biggest moments. Despite their youth, the Crimson were picked to win the league in a pre-season media poll, narrowly edging out Yale and Princeton. The reasoning was that the sophomores’ talent (they were rated the tenth-best recruiting class in the country in 2016) would outweigh their inexperience. Harvard’s non-conference slate demonstrated otherwise. After opening the season with victories at home over MIT and UMass, the Crimson dropped six of its next seven games and finished 5-10 against non-league competition. It did suffer some bad luck, including a stomach virus that sidelined players during a Thanksgiving tournament, as well as the injury to Aiken, who appeared in just four games after an early-December victory at Fordham. But the team also performed erratically. Against Manhattan in November, Harvard fell behind by 18 points in the first half before staging a second-half comeback that fell just short in a 73-69 defeat. The Crimson found a steadier rhythm in conference play, winning 10 of their first 12 league games, led by stout defense: Harvard finished the year allowing a league-best 66.5 point per game. Juzang, who averaged 36.5 minutes per game in conference play, emerged as an iron man at point guard after the team lost Aiken. Center Chris Lewis ’20, a first-team all-Ivy selection, anchored the inside-out offense with 12.8 points per game. Most important was Towns, who averaged 18.6 points per game and shot 49.3 percent from three-point range in Ivy play. That firepower was on display on the final night of the regular season, when Harvard pasted Columbia 93-74 to earn a share of the conference title. After the final buzzer sounded, the team accepted the championship trophy at center court, and the typically reserved Amaker joined the celebration, prompting the entire team to cheer. 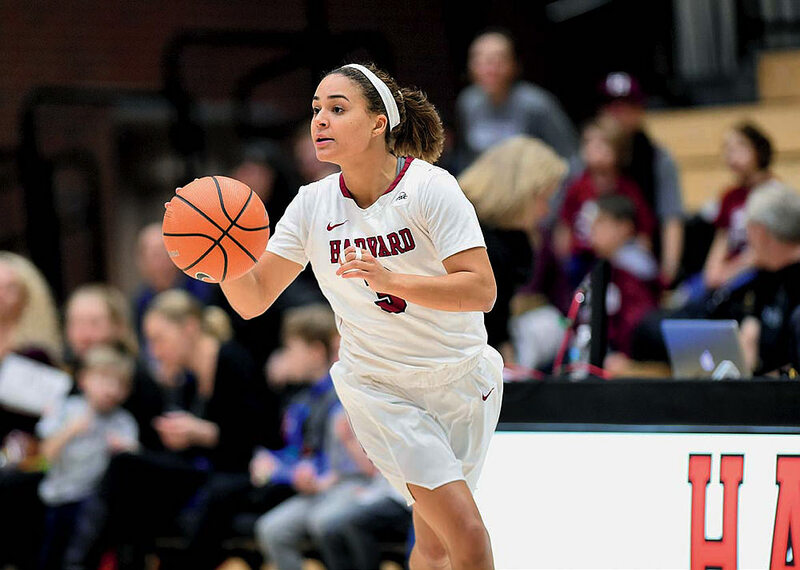 Still, work remained if Harvard hoped to reach the NCAAs for the first time since 2015: the following weekend, the Crimson traveled to Philadelphia for the Ivy tournament. A tie-breaker had earned the team the number-one seed over regular season co-champion Penn. Both squads won easily in the semifinals, setting up the championship showdown on Sunday. At first, Harvard dominated, establishing a 30-17 lead behind strong interior play from Lewis and a flurry of three-pointers. Then that youthful inconsistency reemerged: shots stopped falling and the defense lapsed, leading to a 28-2 Penn run that put the Crimson in a 13-point second-half deficit. Despite losing Towns with just over eight minutes remaining, Harvard stormed back and briefly retook the lead, but couldn’t quite put the game away. Penn would go to the NCAA tournament, but because Harvard had earned a share of the regular season Ivy title and top seed in the conference tournament, the team received an automatic berth in the National Invitational Tournament (NIT), the second-most-prestigious postseason event. Lacking Towns and Aiken, though, the Crimson fell in the first round at Marquette 67-60, ending their up-and-down season. Looking to next year, a returning core of maturing players and the addition of several talented prospects (notably guards Spencer Freedman and Noah Kirkwood) will determine whether the Crimson can return to meaningful postseason play. During the basketball season, Harvard Magazine covered concerns Kathy Delaney-Smith and other women’s basketball coaches expressed about the scheduling of Ivy tournament games: favorable for broadcasters focusing on the popular men’s contests, but disadvantageous to the women student-athletes whom the league also purportedly valorizes. Read the full report, “A Gendered Schedule,” at harvardmag.com/ivy-scheduling-18 . The women’s team—which finished the year 18-11 overall and 10-4 (third place) in the Ivy League—also had a chance to hit a big shot and advance in the postseason. With 26 seconds remaining in the Ivy tournament semifinals and the Crimson trailing Penn 54-51, first-team all-Ivy point guard Katie Benzan ’20 attempted a three. (She had already drained six three-point shots, en route to a game-high 20 points.) But her attempt missed, and for the second consecutive year, the Crimson exited the tournament in the semifinal round. Because the team had a strong regular season record, the Crimson received an at-large bid to the women’s NIT (also for the second straight year)—and, at first, the squad appeared poised to advance, seizing a 33-24 halftime advantage in the opening round at Fordham. But the Rams outscored the Crimson 41-14 in the second half, and Harvard headed home after a 65-47 defeat. The women’s team, like the men’s, retains many of its best players, including Benzan; center Jeannie Boehm ’20 (a second-team all-Ivy selection); and a trio of talented junior guards in Madeline Raster, Nani Redford, and Sydney Skinner. But coach Kathy Delaney-Smith confronts the problem of replacing the production of starters Kirby Porter ’18 and Taylor Rooks ’18, an all-Ivy second-team honoree and the team’s second-leading scorer behind Benzan at 12.5 points per game.